Health site, Greatist, wrote an article, “The 65 Best Health & Fitness Apps of 2014″ Check out the article here. Under30Ceo recently wrote an article titled, “How to Eat Healthy & Stay in Shape While Traveling Abroad” where they recommended us. Check out the article here. AllergyFT was mentioned in the recent book, “The Trim Traveler”, written by nationally-recognized Registered Dietitian Lisa Stollman. 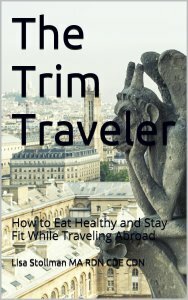 The Trim Traveler includes top-notch info on how to make smart food choices and get daily exercise so that travelers can stay fit and healthy as create their own adventures. Check out the book here. The Universal Doctor Blog wrote an article titled, “Essential Travel Health Apps – Keeping You Safe and Healthy While You Travel”, listing their top 5 travel health apps that can really make a difference in keeping you safe when you travel. AllergyFT was named on the list. Check out the article here. Canadian Living wrote on article, “3 Apps To Keep You Healthy When You Travel” Check out the article here. On allergy focused website, Allergy Shmallergy, an article titled, “Safe Travels! Apps for Food Allergies”, AllergyFT was listed. Check out the article here. Dr. Arthur Lubitz, NYC Allergist, from nycallergydoctor.com named AllergyFT as one of the top 4 ways to “dip into the cuisine” while traveling abroad. Check out the article here. Entrepreneur Podcast Network interviewed AllergyFT creator, Gregg Greenberg, with questions such as, How did you come up with the idea for app? How does the app work? Can you tell us about the development process of this app? How do you see the app in the future? And what marketing tactics are you using today? Listen to the full interview here.